The soft drink giant teams up with a top production studio to create an immersive experience so vivid you can practically taste it. Cascada means waterfall. But there’s not a drop of H2O falling on visitors to the Cascada exhibit in Quito, Ecuador. 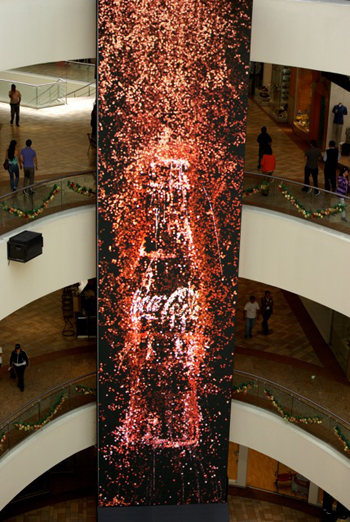 The 52-foot-tall installation is part of an interactive sensory experience that leaves viewers surprised that they’re still dry, and, as the idea goes, in dire need of a Coca-Cola. The global soft drink titan teamed up with London-based production studio Nexus Interactive Arts to create what both partners are calling the largest interactive screen ever. After eight months of preparation and construction, the installation launches November 17 at the El Condado shopping center in Quito, Ecuador. Beyond just a visual spectacle, the waterfall is designed to provide an immersive experience, a feedback loop of happiness. It also reflects an increasingly real-world approach to applying digital technology. This technology, developed by NIA, allows real-time 3-D generative images to mimic the look of liquid sluicing down right before viewers’ eyes. The shape shifting “water” falls down in phosphorescent bursts that evoke undreamed-of colors, as well as good old carbonated caramel. Unlike, say, Avatar, though, it doesn’t require any glasses to enjoy the striking visual effects and lighting. The installation is meant to be symbolic of the way that young people interact with technology now, encouraging them to participate rather than just be passive viewers. Sure enough, the digital waterfall is highly responsive, and it reacts in real-time. Users stand inside of a hub area facing the screen, and their motions are captured and mirrored back at them in negative space on the vertical stream, with water gushing by on either side. At 16 meters high, Cascada has the scale of an actual giant waterfall and all the liquid and particle simulation that a waterfall would have. More importantly, though, it has a story. “At first, it was only tech people who were getting involved in the digital space,” says Chris O’Reilly, creative director and cofounder of Nexus Productions. “Now it’s artists and other people who understand design and storytelling.” The narrative of Cascada is that it’s a waterfall that wants to play with you. Cascada offers users a silent invitation to come play with it, and the waterfall actually gets “happier” as you do. The initial colors are more muted and ambient, but as it responds more, the colors become more vivid. By making different gestures, users can effectively control the life of the waterfall. A group standing in a circle holding hands, for example, would cause the water to collect and increase in volume–completely filling up the top half of the screen. When the group eventually let go, the extra water would flow down in a gushing torrent, and then resume business as usual. The sound effects are also state of the art. Inspired by bark river drumming, a series of percussive pops and splashes break through multiple layers of whooshing–all responding in real-time along with the user’s actions. Combined with the visuals, the aural background creates a truly immersive atmosphere. After the initial launch in Quito, Ecuador, which will take place over the next seven weeks and should see nearly 2 million visitors, the installation will be touring across Honduras and Colombia early next year.